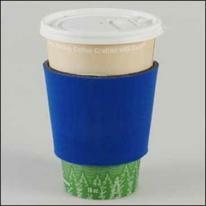 Our new Coffee Cup Insulator keeps your morning coffe warm and protects your hands from scalding heat. Fits most disposable paper and styrofoam cups. Product Size: 2-3/4" x 4-1/2" Imprint Area: 1-3/4" H x 3 1/2" W Packaging Dimensions: 21"(L) X 16"(W) X 13"(H) Units Per Box: 500 Shipping Weight: 20 lbs. Folding foam can/bottle holder. Imprint area : 3" w x 3" h Packing / Shipping weight : 300 per case/10 lbs. Organza is a thin, sheer fabric woven in nylon. Comes with ribbon drawstring. 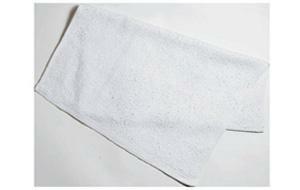 Product Size: 3" X 5-1/2". Packaging: Factory Bulk. Popular foam style Holds 12 oz. cans Large imprint area 6 colors available. Imprint Area: 4" W x 3" H per side. Packaging: Standard Packaging is 200 per box. Weight: 200 pcs. - Ground Shipments - 30 lbs. Air Shipments - 45 lbs. An insulated neoprene can cooler with a pocket sewn onto one side. Holds credit, drink and business cards or a can opener. 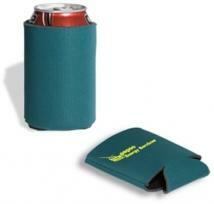 Promote a company message on the Stubby Cooler and place a business, discount or club card inside the pocket. 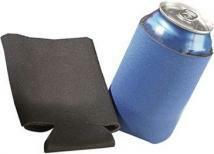 Made with real neoprene, not foam and fits any standard size 12 oz can of beer or soda. Note: Second color printing requires additional set up and run charges - please call. Size: 4"w x 5"h Imprint Area: (front) 2"w x 2"h (back) 3 1/8"w x 3 1/2"h Carton Size: 14.5" height x 14.5" width x 18" length Carton Weight: 33 lbs/500 pcs. Light weight foam construction Space-saving collapsible design Very effective foam insulation Minimizes external condensation. 14 Colors available. NOTE: Small details or small type will not be legible. Puffy ink used. 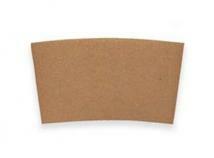 Actual Size: 3-3/4" H Imprint Area: 2 Side (standard): 3-1/4" H x 3" W per side Packaging: Bulk Shipping Weight: Approx. 16 lbs. per 600. Due to volume, dimensional weight of 38 lbs. per 600 will be billed. An insulated neoprene can cooler with a white board sewn on one side and a white board marker with an eraser cap. Great for indentifying drinks and simple messages. Made with real neoprene, not foam and fits any standard size 12 oz can of beer or soda. Note: Second color printing requires additional set up and run charges - please call. Size: 4"w x 5"h Imprint Area: 3 1/8"w x 3 1/2"h Carton Size: 14.5" height x 14.5" width x 18" length Carton Weight: 33 lbs/500 pcs. PATENT PENDING. 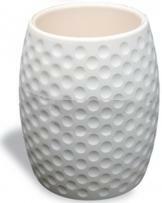 A hot new twist for a great product, we fill the exterior with foam beads to form fit to your hand. The interior is similar to the K-861 and made with an insulated can / beverage cooler which is made with real high quality neoprene, not foam. Fits any standard size 12 oz. can of beer or soda. Size: 3"dia Imprint Area: 8"w x 3"h Carton Weight: 9 lbs/100 pcs. 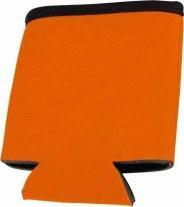 An insulated neoprene can or beverage cooler with a stitched rim made with real high quality neoprene, not foam. Fits any standard size 12 oz. can of beer or soda. Note: Second color printing requires additional set up and run charges - please call. Size: 3"diam x 4 3/16"h Imprint Area: 2 1/2"w x 3"h Wrap Imprint: 7"w x 3"h Carton Size: 17" height x 14" width x 20" length Carton Weight: 11lbs/100 pcs. A T-Shirt shaped insulated bottle cooler made with real high quality neoprene, not foam. Fits any standard size 12 oz. bottle of beer or soda. Note: Second color printing requires additional set up and run charges - please call. Size: 3 3/4" w x 5 1/2" h Imprint Area: (Front): 3"w x 4"h Imprint Area: (Back): 3"w x 5"h Carton Size: 19" height x 15" width x 23" length Carton Weight: 19 lbs / 800 pcs. Beautiful full color graphics. Quick wrap velcro closure. Expansive edge-to-edge imprint. Comfort grip fabric surface. Imprint Area: Wrap: 4" x 9". Add additional 3/8" to imprint area for full bleed. Packaging: Bulk. Shipping Weight: 6lbs/100. 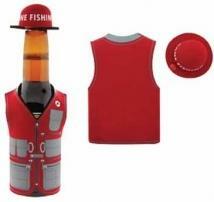 An insulated neoprene bottle cooler in the shape of a water life preserver vest. Great for boating, sailing and beach promotions and safety awareness programs. 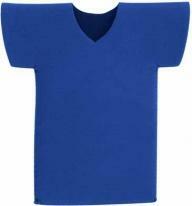 Made with real neoprene, not foam and fits any standard size 12 oz bottle of beer or soda. Note: Second color printing requires additional set up and run charges - please call. Size: 4"w x 5 1/4"h Imprint Area: 2 7/16"w x 4"h Carton Size: 17" height x 14" width x 15" length Carton Weight: 20 lbs/200 pcs. Great for boating, sailing and beach promotions and safety awareness programs. Note: Second color printing requires additional set up and run charges - please call. Size: 4"w x 5 3/4"h Imprint Area: (vest) 2 7/16"w x 4"h (hat) 2 1/2"w x 5/16"h Carton Size: 17" height x 14" width x 15" length Carton Weight: 20 lbs/200 pcs. Show up at your next soiree in eco-savvy style with this fabulous tote. 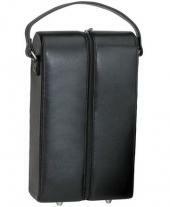 Ideal for transporting multiple bottles, it features 6 separate compartments to keep each one secure. Made of 100% post-consumer recycled laminated PET, with subtle swirls that twist across the shiny surface, giving it an eco-chic appeal. It's water resistant, washable, reusable and recyclable. Size: 12" x 10 1/2" H x 8" Imprint Area: On front or back panel, approx. 7" W x 8" H". One-Bottle Wine Box. These unique wine bottle gift boxes ship flat. By simply lifting the lid up and pulling up the sides, up pops a sturdy, rigid box that holds one bottle of win. White paper lining inside. To make the box permanent (non-collapsible) adhesive is under peel-off paper at the four corners. Two elastic straps hold each bottle tight inside the box. Magnetic top closure. Product Size: 13" x 4-3/8" x 4-1/4" assembled (flat: 8-1/4" x 13"). Imprint Area: 2-1/2" X 1". Packaging: Factory Bulk. Two-Bottle Box. These unique wine bottle gift boxes ship flat. 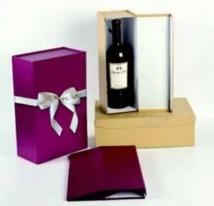 By simply lifting the lid up and pulling up the sides, up pops a sturdy, rigid box that holds two bottles of wine. White paper lining inside. To make the box permanent (non-collapsible) adhesive is under peel-off paper at the four corners. Two elastic straps hold each bottle tight inside the box. Magnetic top closure. Product Size: 13" x 8-1/4" x 4-1/4" assembled (flat: 12-1/4" x 13"). Imprint Area: 2-1/2" X 1". Packaging: Factory Bulk. "The Pack-and-Go Collection" Celebrate life's occasions in style. 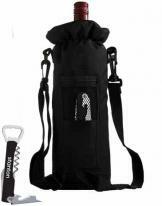 Insulated wine bottle caddy Features detachable strap and wine opener. 600D Polyester. Product Size: 4 1/2" x 12" Imprint Area: 2" x 1 1/2" Packaging: WT/PC: 30 lbs./50 units (master carton) Bulk: Bulk. Two bottle capacity. Insulated cooler features two-bottle capacity with interior bottle sleeve to separate and protect bottles during travel. Side loops to secure screw top bottle opener (included). Velcro top closure. Front zippered pocket and top grab handles. Includes an educational product hang tag. Fabric/Material: 70% Recycled PET/Thermal Lining Size: 6.5"L x 13"H x 4.5"W Imprint Area: Front pocket center 4"W x 6.5"H Shipping Information: Carton Size: 24"L x 17"H x 16"W Quantity: 60 Weight: 18 lbs. Other decoration methods are available for this item, please call. 600D Polyester. Detachable and adjustable shoulder strap. Plastic reinforced handle. Insulation maintains wine temperature and protects contents. Convenient outer pocket on both sides for extras such as corkscrew. 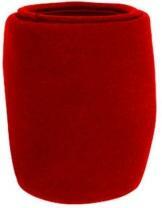 Detachable velcro divider allows for one or two bottles of wine. Zippered closure. Product Size (H x W): 15.00 x 8.00 Imprint Area: Front Pocket 3"h x 3"w Packaging: Polybag Pieces Per Box: 50 Weight Per Piece: 0.60 lbs. Weight Per Box: 30 lbs. Case Dimensions (L x W x H): 18 x 16 x 21. 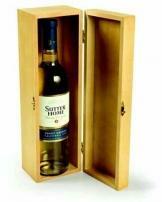 This natural wood color wine chest makes an excellent presentation for a wine bottle. Brass latch and hinges. Weighs 1 lb. 3 oz. Product Size: 13-1/4" long, 4" wide, 4" deep. Imprint Area: 7" x 2". Packaging: Factory Boxed. 13" X 3.5" X 3.5" Wine Box. Material: Deluxe poly plastic only. Closure: Tuck-in closure and die cut handle. Size: 13" x 3.5" x 3.5"
Durable dobby nylon. Inside of cooler is lined with cubes of water; freeze and go - no messy ice needed. Holds one bottle of wine. Great for bottled water, too. Size: 4.5"W x 14"H x 4.5"D Imprint Area: 2.5"W x 2"H Product Weight: 64 lbs. per 12. The Pack-and-Go Collection, The perfect way to give, Features: insulated wine compartment, secure closure, wooden handled corkscrew and durable handle, 1200D Polyester. Size : 4.5"w x 2.5"h x 12.5''d WT/PC: 22 lbs./30 units (master carton) Packaging: Bulk pack. Includes laser etched ingot plate. Large main compartment with wetsuit technology maintains hot/cold temperatures. Fits one wine bottle. Basket-style handle for comfort. Exoprene fabric. Size: 3.5"W x 16.5"H x 3.5"D.
Includes laser etched ingot plate. Large main compartment with wetsuit technology maintains hot/cold temperatures. Fits two wine bottles. Basket-style handle for comfort. Exoprene fabric. Size: 7"W x 16.5"H x 3.5"D.
There's no reason to brown bag it anymore when you can use the Six Pack Tote instead. It's perfect to take to the beach, park, or party, and keeps beverages cool up to four hours. This tote is as slim as a thin mint when not in use, but don't be deceived by its size-it expands to fit the canned or bottled beverage of your choice. Just ask any Joe Six-pack. Insulates six 12-20 oz. cans or bottles up to four hours (time varies depending on external temperatures). Made from neoprene (the wetsuit material). Soft-grip handles. Stores flat. Machine wash cold, drip dry. Size: W 11" x H 11.5" x D 1". It's cool to carry! This single bottle, black leather wine carrier will chill wine from room temperature to serving temperature with its perfectly padded and insulated interior. Finish/Material: Leather Dimensions: 5 1/8" W x 16 5/8" H x 3 5/8" D Imprint Area: 2" W x 2 1/2" H Shipping Information: Carton Size: Box Length: 21.00 Box Width: 18.00 Box Height: 12.00 Standard Packaging: Individually Carton Weight: 11lbs / 10pcs. 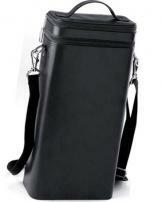 Tall and sophisticated case features padded interior for bottle and tools. 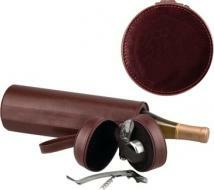 Tools include bottle drip ring, corkscrew/foil cutter, and bottle stopper. Artwork is screen printed on top of case. Includes a white gift box. Actual Size: 14" H x 3-7/8" Dia. Imprint Area: 2-3/4" Dia. Packaging: Bulk. Individually Gift Boxed Shipping Weight: Approx. 17 lbs. per 12. Hand crafted wine case-single. Finish/Material: Wood Dimensions: 5.50" W x 14.00" H x 5.5" D Imprint Area: 1 7/8" W x 1" H Shipping Information: Carton Size: Box Length: 6.00 Box Width: 14.00 Box Height: 6.00 Standard Packaging: Individually Carton Weight: 31lbs / 16pcs. Hinged, rubberized surface. This bottle-shaped cabinet with magnetic closure contains a stainless steel curved corkscrew, foil cutter, chromed bottle stopper, stainles steel drip collar and stainless steel pourer with stopper. Weighs: 1 lb. 1 oz. Product Size: 12-1/2" high. 3" dia. Imprint Area: 1-3/4" X 2" high. Packaging: Factory Boxed. 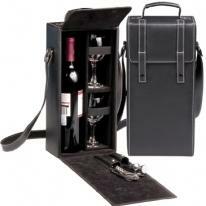 Carry Wine in style! 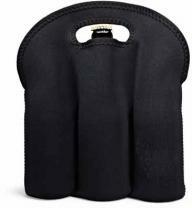 Zippered and padded carrying case includes convenient opener. Product Size: 4-1/4"Diam x 15"H Imprint Area: 2"H x 2"W Note: Price includes one color/one position silkscreen imprint Screen charge: $50 per color/position/style Less than minimum: add $75 per color/position/style For additional run charges and imprint details, call for info. Weight: 16 pcs / 38 lbs. A well-kept wine is a happy wine! Bringing two bottles along in this padded and insulated black leather wine carrier will keep you and your wine beautifully blissful. Finish/Material: Leather Dimensions: 8" W x 16 1/2" H x 3 5/8" D Imprint Area: 3 1/8" W x 2 1/2" H Shipping Information: Carton Size: Box Length: 22.00 Box Width: 19.00 Box Height: 18.00 Standard Packaging: Individually Carton Weight: 28lbs / 10pcs. Wine case double. Finish/Material: Wood Dimensions: 8.50" W x 15.50" H x 5.5" D Imprint Area: 1.500" W x 0.500" H Shipping Information: Carton Size: Box Length: 8.00 Box Width: 16.00 Box Height: 6.00 Standard Packaging: Individually Carton Weight: 27lbs / 8pcs. Mahogany finish box with Silver latch. 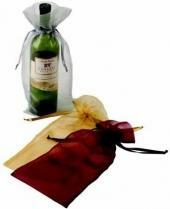 Includes collar, bottle stopper, bottle pourer with stopper, thermometer, aluminum corkscrew and black flock gift pouch. Product Size (H x W x D): 4.50 x 4.38 x 14.25 Imprint Area: Aluminum Plate 3/4"h x 2"w Packaging: White Gift Box Pieces Per Box: 9 Weight Per Piece: 3.44 lbs. Weight Per Box: 31 lbs. Case Dimensions (L x W x H): 17 x 16 x 16. Protective case with double snap closure, carrying handle and shoulder strap with 16" drop height, 5 piece set includes two glass goblets. Stainless Steel wine opener and stopper. FDA compliant materials. Simulated leather with White accent stitching. Product Size (H x W x D): 13.50 x 3.75 x 6.75 Imprint Area: Aluminum Plate 1/2"h x 1 3/4"w Packaging: Gift Box Pieces Per Box: 8 Weight Per Piece: 4.13 lbs. Weight Per Box: 33 lbs. Case Dimensions (L x W x H): 20 x 18 x 17. 600D Polyester with simulated leather pouch and Trim. FDA compliant materials. 4 piece set includes a 24 oz. Stainless Steel vacuum insulated bottle and two 10 oz. 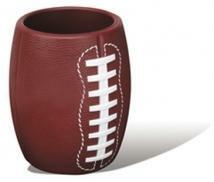 double wall Stainless Steel cups featuring simulated leather removable wraps. BPA Free. Comfortable carrying straps with 3 1/2" drop height. Product Size (H x W x D): 12.00 x 4.00 x 8.00 Packaging: Gift Box Pieces Per Box: 12 Weight Per Piece: 2.83 lbs. Weight Per Box: 34 lbs. Case Dimensions (L x W x H): 25 x 13.5 x 15.5.